Above is PD7MAA’s graphic for his transformer. It is a little confusing as an 11t wind will start and finish with ends as the blue wind, so the red winding must have and odd number of half turns which suggests the windings are actually 1t and 5.5t (pity he did not show a picture of the real transformer). Let’s proceed under that assumption. 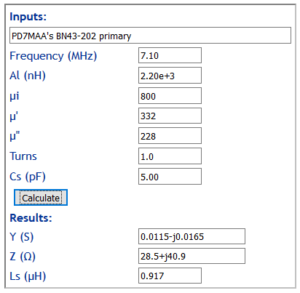 Let us calculate the magnetising admittance of the 1t primary at 7MHz. Gcore is the real part of Y, 0.0115S. If Yin of the loaded transformer is 0.02S, we can calculate the core efficiency as 1-Gcore/Gin=1-0.0115/0.02=43%, core loss is 3.7dB. The average power of uncompressed SSB telephony is about 3%, so the average power of a 20W PEP SSB transmitter is about 600mW, and 57% dissipation is only 340mW which the core should safely withstand. Losses in the matching transformer are only part of the total system loss, and overall system efficiency will be lower than estimated here for the transformer alone. 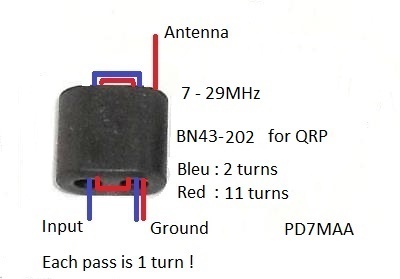 Low efficiency is not uncommon in QRP systems as even when more than half the transmitter power is lost in the core, the core survives by virtue of the low input power whereas a 1kW transmitter would destroy the core in short time. Some hams might question the wisdom of “chucking away” transmitter power when you don’t have very much to start with, but the logic might be that the purest form of QRP is to start with a low power transmitter and then waste more than necessary in an inefficient antenna system. 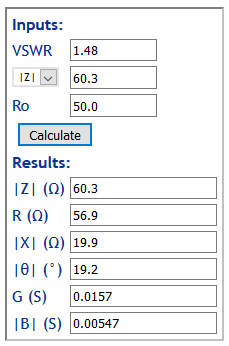 PD7MAA does give a measurement of Zin with a 3k3Ω resistor load as VSWR=1.48 and |Z|=60.3Ω. Above is a calculation of Gin and |Bin|, and if the 3k3Ω load (G=0.000303S) is transformed approximately by the turns ratio (though that is a gross approximation), it would present G approximately 0.0092S in parallel with the magnetising admittance estimated at 0.0115+j0.0165S above for total Yin of 0.021+j0.016S which is in the ball park of the admittance implied by PD7MAA’s measurements (given the tolerances of ferrite and the approximations mentioned). 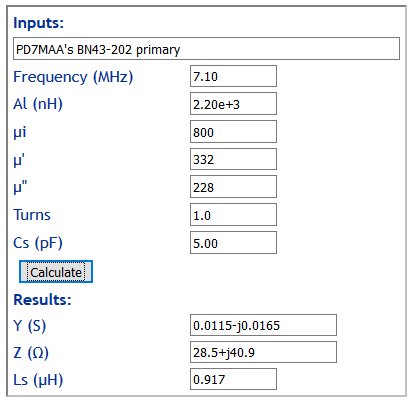 PD7MAA’s measurements support the assumption of a 1t primary and 5.5t secondary.